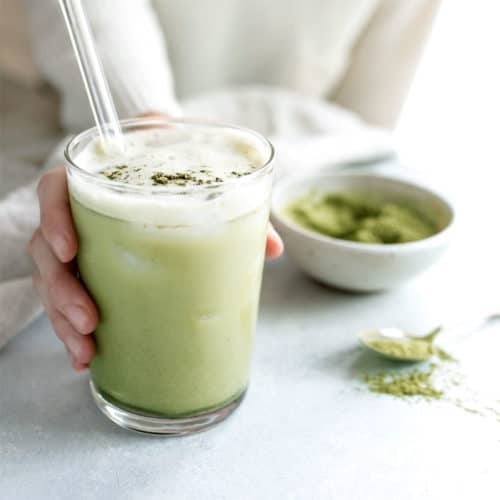 This Matcha Latte is easy to make at home, using just 3 ingredients. I love that it's dairy-free and naturally sweetened for an energizing alternative to coffee. Enjoy it hot or cold! For a warm drink, use boiled water, and for an iced drink use cold or room temperature water. In a blender, combine the water, dates, almond butter and matcha. Blend until the dates have totally broken down and the mixture looks creamy. Taste and adjust the ingredients as needed to your taste. I typically use 1/2 teaspoon of matcha to keep the caffeine lower, but 1 teaspoon will have more and a stronger matcha flavor. If you don't have a high-speed blender, pour the mixture through a fine mesh strainer to remove any bits of date that didn't get blended, directly into your cup. Serve right away, and over ice for a chilled drink.